Simple erosion control for a hillside or garden slope. Things to look for before you even start on a garden, landscape slope or wild hillside. Drainage. Is there water moving across slope or down the hillside? Has erosion been common on this slope? Are there small or large channels on the slope? Where is the water going in the landscape? You cannot let water run on a slope. Be a control freak and the slope will be much more stable. Is the soil on the slope stable or is it a sand dune? Sand slopes can be landscaped with a mixture of perennials, groundcovers, bushes and trees, with a layer of shredded bark. (On the surface, NOT tilled in.) Different root depths using little water will tie up the slope, the mulch will stop most surface activity. Go up on the slope and dig a hole, (dig the hole where you'll plant a plant later). Is there solid rock under the top one inch of soil? Mud on rock or clay are also a problem. Why are people surprised when these slide? These slopes need trees, and if possible, spring boxes or some other means of moving the water off the slope. Picture truckloads of mud on a slick concrete driveway that is tilted at 45 degrees. Does the landscape have permanent bald spots? Some areas of California have serpentine soils that really do not support live. If you have a rock outcropping, enjoy it, stop trying to plant it. It's a rock, not a rose garden. How good is the drainage? Fill that hole you dug with water and time how long it takes for the water to drain. An hour or less is good; if 2-3 days, then the slope has a problem. Dig around some more and see if there's rock under it. Have a soil analysis down and look for sodium, boron or high calcium. Do not fertilize and do the stuff the report says to do, just see if there is something that's way off. There are places in California with your soil that probably has plants that will grow on your slope. Search our site for your problem. e.g., "high boron"
How steep is the slope? Can you walk on it? Crawl on it? Rappel from the top? If it is too steep to walk, can you make cross paths? Can you run a wheelbarrow up it? Can you make a path that would allow a wheelbarrow on the hillside? Staircase? Ladder? You'll need at least a few weedings and waterings to establish the plants; how will that be accomplished? Is the slope accessible at all? Is it possible to bring the slope back into the landscape or garden? If you can't get on the slope, you have a problem. Is there irrigation available on at least part of the hillside? Water of any kind? (You can plant the hillside without water, but it is more difficult, not as pretty and more fire prone.) On the other hand, the more water you put on the slope, the more unstable the slope will be. How is the sun? Is the slope full sun, part shade, morning sun, afternoon sun. (It's amazing how people have trouble noticing this, but plants sure do.) Some 'a little sunny' slopes could bake a chicken in an hour or so. Put some shorts on and go weed the slope in early afternoon, is it sunny? Long term studies have shown a well designed hillside garden planted in native plants has no measurable erosion. 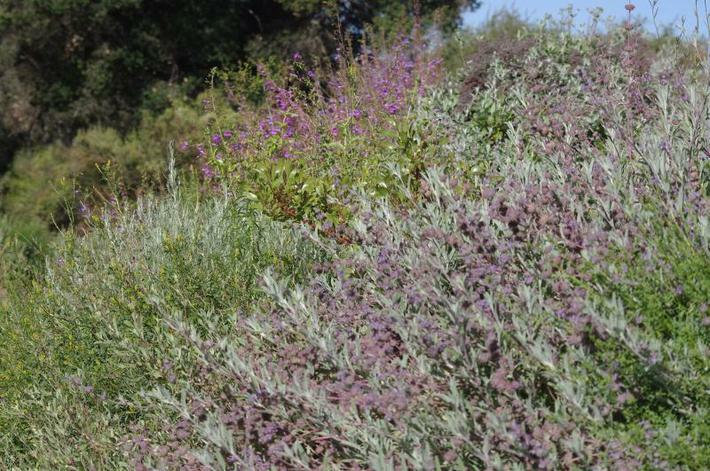 California native plants provide a low tech solution to slope management. Though this slope appears quite rocky and without enough soil, it was planted with California native plants, in a mixed planting. Erosion gradually decreased on the slope. A native hillside with no erosion. A planted slope in San Luis Obispo. Ground caver sages do very well in Los Angeles, San Diego or Santa Barbara also. Native plants will grow on almost any hillside or slope. An unwatered slope. Because it's in part shade these plants are doing fine. In full sun they would like a little water during the summer. Overhead spray about 10 minutes once a week is enough to make these plants nice looking through most of California. From left to right , Artemisia californica Canyon Gray Canyon , Ceanothus hearstiorum , Ceanothus Yankee Point, and Salvia sonomensis Mrs. Beard Mrs. Beard. Most hillsides can be made relatively stable with plants . A planting can stop nearly all erosion and hillside movement in a landscape. Almost. The only way of stabilizing a slope better than plants is a reinforced retaining wall that you need to take a mortgage out to put up($50,000-100,000 is common). Also, the type of mulch you use is important. Do not use compost, rice straw, hay straw, large chunks of bark, etc. I really do not understand how people got such silly ideas. Bark floats, straw has weeds and favors weeds and gophers, rice straw floats and nothing seems to live where it is. I guess it's better than newspaper and garbage bags, but barely.See the soils page. You can sometimes make a low retaining wall in to a series of low steps. DO NOT change the grade around existing trees. Both of the oaks in this picture are dead from the retaining wall. The person that rented this property thought that dry stack walls would be lovely. Some very strange person was living in a tree and building these dry stack walls with a pick, shovel and wheelbarrow, while nine dogs were barking at him. (They had also built a three foot dry stack wall a foot from the house.) After 20 years the trees are dead from the grade change of the retaining walls, and the people are not any smarter. For most trees a grade change of an inch of added or removed under the tree can do them in. But as always, it varies, the less under the tree, the less area, the less depth, and the tree will be healthier longer. Water regimes are similar. Do not alter drastically the watering of an old tree. Many native trees live for centuries, altering the soil depth or rainfall in a month or even a year is similar to dropping us off in a foreign land with no money, no clothes and no language. AND, the trees can't walk. For more garden walls look here. Dry stack walls are rocks stacked on each other. Old erosion ideas that don't work. Planting grass on a slope does not stop erosion. Erosion studies have consistently shown that slopes that were seeded with grass have GREATER EROSION than anything other than bare ground. (Even dead sticks beat grass!). Just because the world is full of ignoramuses, you do not have to do what they do. Don't seed slopes with grass. This ignorance of seeding grass on slopes to control erosion has been perpetuated for about 100 years and still occurs after fires in some poorly educated sectors of our country. EVERY study that has ever been done recommends against seeding grasses. After spending a day trying at the Cal Poly library to find an article supporting the seeding of grass to control erosion I could find none. One of former biologists for Forest Service(she quit over this) spent 10 hours at the UC Santa Barbara library trying to find documentation for seeding grasses, she could find none. Seeding slopes after a fire or grading does nothing but destroy the ecosystem for perpetuity. Bare, grass-covered or ice plant-covered slopes commonly load up to field capacity (and beyond), while slopes covered with a mix of native shrubs and trees and perennials rarely do(Patric). In a home landscaping seeding with grass makes a weedy slope that is very hard to stabilize and reestablish plants on and it creates a different plant community, ie. Weeds. The type of mulch, placed on top of the ground, is very important in the management of a slope susceptible to erosion. See the mulch page for appropriate types of mulch to use. If you use the wrong type of mulch the plants will not grow very well, weeds could be introduced, and erosion could be increased! Plastic is for bags, soda bottles, and children's toys. If you stuck those items on the hillside they would be about as attractive and effective for erosion control. (After a few years the plastic 'weed barrier', 'mulch' or 'erosion matting' has curled and is sticking up in amongst the weeds.) I removed some of this stuff off of a 'restoration project' (in a shady spot) near San Luis Obispo a few years ago. The ground was practically bald (nothing much was alive) after 2 years, except a little annual rye grass. Next to the plastic, there was near- normal recovery. In other places where this plastic matting was used (sunny spots) the weeds had gone crazy. Short term solution that is a long term pain. Straw is for animal bedding. On slopes it works for about 15 minutes during the first rainfall. Then the hillside is a weedy, muddy mess and the straw is somewhere else. Also, you have just introduced a massive amount of weed seeds. As with grass, the erosion is greater with straw than mulch, plants, boulders, walls or anything other than loose dirt. If you like erosion, fire, gophers and mice, put straw around your house. Straw=weeds= rodents=erosion. Most of the plastic peeled off. The dead grass was seeded in by fire agencies . If you seed after fires you get more frequent fires. Parts of Los Angeles burn almost every year because of previous seeding and spreading of straw. PLEASE do not seed your slopes with grass. It makes the erosion worse and makes your site more prone to fire. Removing the 'brush' and seeding with grass is barbaric and has no scientific basis. Straw is for horse bedding, not erosion control or slope landscaping. A straw blanket/mat slope before the rain. Straw mat hillside sliding away after a few light rainfalls. Should have been terraced with cross drains, mulched and planted. Malibu uses concrete as 'erosion' control. Weird! The coastal sage scrub is beautiful and stable. Some dummy clears the 'brush' and plants grass, the hillside slides, so they cover it with cement that gradually cracks, costs a fortune, looks UGLY, and is dead. And after about twenty years, the concrete falls off of the slope. Also if the water doesn't go into your soil, it's running on to the neighbors slopes and causing more problems downslope. They all behave the same way in a wet year. These plants are not appropriate to control erosion on a slope because 1) they are alien plants and not part of our natural plant community, 2) they have very shallow roots. 3) they are heavy. The slopes load up with rain water to full saturation and then shed/slide off. The top vegetation actually ADDS to the weight of the slope. It feels just like a wet shag carpet, and the roots are about as deep. I wish the news people would get it right; it usually isn't mud slides, it's ice plant or 'grassland' slides. The jute burned also with foot and half flames. Actually spread the fire. Properly applied mulch burns with almost no flame. Many people are concerned, and rightly so, about fire danger. That is why so much iceplant has been planted in southern California. The green part of ice plant does not burn very well, (the brown build up under it does though). Having iceplant on the hillside actually increases erosion or time. That is how iceplant reproduces, by landslides. If you live in a critical fire area, instead of ice plant, you can space the California native plants (some are more fire retardant than others) apart, with mulch and/or pathways in between, to reduce the fire danger and also control erosion on your slope. In fire areas it reduce the planting density to about 30-40% cover..
Plan for a fire, remove the weeds, not the natives. Jute kinda works on small slopes, with small problems. Not great, but it can work short term until your planting is established.Plants and mulch seems to work better. If you combine the jute with mulch it can be used to hold a steeper slope than either can hold by themselves. Put down about one inch of mulch, (shredded redwood, cedar, oak, or pine), roll out the jute and pin it down, cover jute again with another one inch of shredded mulch. Make sure you do a FULL planting for this to work. Pop the plant out of its gallon container, and set it carefully to the side. Cut the jute, carefully fill the empty pot with dirt from the hole you dig. Pull the mulch and jute to the side. Set your plant into the hole you made, then put the jute and mulch back into place. Haul the extra dirt away. Flapping in the wind doesn't seem to a slightly intelligent person to help anything. If you look carefully you can see on patterns on the bare soil where the jute blew off. The spray went through the jute and bet the bank up. The flapping jute was pounding another section of the slope. Very rough to deal with a coastal bluff like this. No good answers, all lesser of evil. Good! A mixture of deep-rooted California native shrubs, and trees, mixed with shallow-rooted shrubs, and perennials, mulched and with no weeds, will control erosion on the slope. Why should you plant a California native plant community on the slope and not grass or ice plant! Because the native plants connect with each other underground, and the microorganisms that live in association with them produce tiny threads that ramify through the soil, coiling around particles of sand and clay and holding them, and also producing glue-like compounds to hold the soil particles. This interconnection, I guess you could think of it as a natural microorganism community underground living in cooperation with the plant community aboveground, which the grass and iceplant, and other alien plants do not possess, is why it is critical to plant California native plants in a spaced plant community to control erosion on a slope. Mynativeplants.com is a search engine to provide a plant list for your particular site. The plants love the slopes. Enter the information you found going through the list above and TA DA!, you have a working plant list. Start with that list and 'weed' out the plants you do not think will work, or you just don't like. Try to get down to about 5-10 plant types altogether for most of the slope. Planting by rope. The contractors we've worked with have implemented this solution several times. Rappel from the top and plant enough of a planting on the rock outcropping to make the slope secure. Take pictures for the grandkids. Terraces. Sometimes the nasty landscape slope can be made usable by cutting simple garden paths across the slope. The resulting steeper slopes can be readily accessed from the path below. Make sure you account for runoff across the slope on the path. The path can become a storm drain if it runs across the slope at an angle. That is ok, as long as you put some rocks and boulders along the inside of the path to slow the water and stop erosion as the water blasts across the slope in a down pour. The goal is to control the runoff in a way that does not cause further problems. Feeding the runoff off a slope onto your neighbor's slope is not drainage or damage control, it's a lawsuit. If the cut slope is large, put a 8-10 foot terrace every fifty feet, PLEASE! This may add a little to the grading costs, but will make the restoration of the slope easier and much more functional long term. I can't understand why engineers think they do not need this. I'd put it in law if I could. This terraces will commonly save a slope as a small slide is manageable. From the San Dimas Research Experiment of erosion and hillside runoff. If the hillside has native plants covering it, there was no runoff and the soil slowly relesed the water over the season. A trace of runoff from native plant covered slopes. Grass covered slopes lead to hillside erosion and possible landslides. 30-75% of all rainfall on grass- covered slopes ran off. The native plant -covered slopes also stayed drier in winter. Weedy or grass cover slopes get very wet very fast and either shed water or slide mud. Iceplant, Vinca, Ivy fits the weedy role, not the native role. So bare soil or grass (or straw) -covered slopes experience boundless erosion through mudslides (wet slopes) and surface gullies when compared to the "beggarly erosion of slopes planted in a community of native plants". One to two foot high groundcovers The real groundcovers that should be used on large slopes. More examples of planted slopes in California. All are getting no supplemental water. Most were watered at planting(during winter) or few times for the first season. This slope is on a coastal bluff in San Luis Obispo County. Baccharis Pigeon Point mixed with Hummingbird Sage, Coast Sunflower and Ceanothus maritimus make a beautiful groundcover and zero runoff. Salvia Bee's Bliss or Salvia Gracias make a very fast groundcover the can cover a slope very fast. Mix some Penstemons in for more color, some Manzanitas and Ceanothus for texture and long term slope stabilization and you have a winner. Sunset Manzanita and Harmony Manzanita with some Ceanothus make a great bank cover. This slope had Ceanothus Joyce Coulter and Ceanothus Mill's Glory mixed in with the manzanita and the deer left it alone. A short video about simple erosion control for a hillside or garden slope. This is the first of a short series. A short video about erosion control for a hillside or garden slope. This is 2 of a short series. A short video about how to plant and control hillside erosion. This is 3 of a short series.